In the following section you will find developer docs that should give you an overall understanding of the more important aspects of Scipio ERP development. We highly recommend to start with the architecture, as it will guide you through the source itself and also outline how the technologies work together. 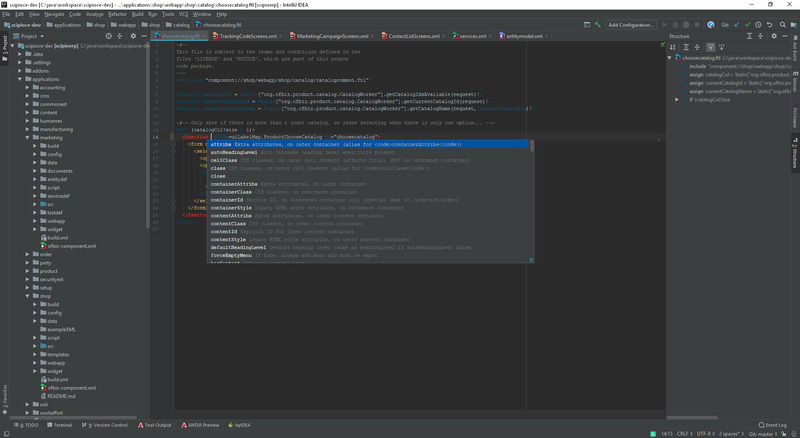 Download our IntelliJ IDEA integration! Our IDE plugin for IntelliJ IDEA is specially designed for an ideal developer workflow. The plugin is compatible with IntelliJ IDEA community edition and comes with a range of support functionality you truly don’t want to miss out on. Run the project importer to easily setup your Scipio ERP developer environment. Our templating toolkit editor supports syntax highlighting, auto-complete, in-place documentation, structured view and more. Edit all Scipio ERP configuration files (screens, services, entities, components etc.) with ease. Features include a structured view, “component:…” url recognition, auto-complete, in-place documentation and more. Use the run/debug templates to easily test and debug your own sources. Add your own build-tasks and customize to your own comfort. Follow these simple steps to setup your Scipio ERP workstation. Use our “Run/Debug” template to easily debug Scipio ERP from inside IntelliJ IDEA. Customize the highlighting colors to your own liking. Download Intellij IDEA or use your existing Intellij installation. The plugin is compatible with the IDEA community edition. Open “File” > “Settings” > “Plugins” (CTRL+ALT+S) and search the marketplace for “Scipio ERP”. Install the plugin. Open “File” > “New” > “Project from Existing Sources” and select your project root directory. Choose “Import project from external model” and select “Scipio ERP”. Follow the install wizard. Scipio ERP started out as a fork of the Apache OFBiz project and remains compatible. So the Apache OFBiz documentation can be helpful for general references. In addition, the following books are a recommended read to ease your way into development. Find out all about SCIPIO development and how you can customize the software to fit your own needs.